Austrian Prime Minister Sebastian Kurz has expressed grave concern over the plans of the German government to set up checkpoints at the Austrian-German border, as per an agreement between German Chancellor Ms. Angela Merkel and her Interior Minister Mr. Ernst Seehofer. Ms. Merkel and Mr. Seehofer, heads respectively of the CDU and CSU who are in a coalition agreement, made the arrangement to soothe both parties and to stave off a government crisis. However, their southern neighbor Austria believes that setting up checkpoints at the border would leave them with many unwanted migrants in excess. The plan of Ms. Merkel entails that any migrants that show up at Germany’s borders which have already been registered for asylum in another European nation (for example Greece or Italy) would be returned at the border. However, given that Germany shares a border with only two nations from where the migrants coming from Italy or Greece can enter, namely Austria and Poland, and Poland refuses to take on any refugee at all, Mr. Kurtz believes that such an arrangement would leave Austria with many unwanted asylum seekers in excess. “We will be obliged to take measures to avoid disadvantages for Austria and its people,” the Austrian government said in a statement in response to the German asylum deal. Furthermore, whilst speaking at the European Parliament, the Austrian PM Kurz called for a “shift in migration” and stated that “a Europe without internal borders would only be possible in the long term with changes”. Mr. Kurz stated that he would align his government with the actions of Mr. Salvini in Italy if Germany wishes to act unilaterally. In other words, Austria would once again close its border to migrants. Furthermore, the Austrian government of Mr. Kurz is bound to take over as head of the European Council this week, which is a rotating six-month presidency between the member states. 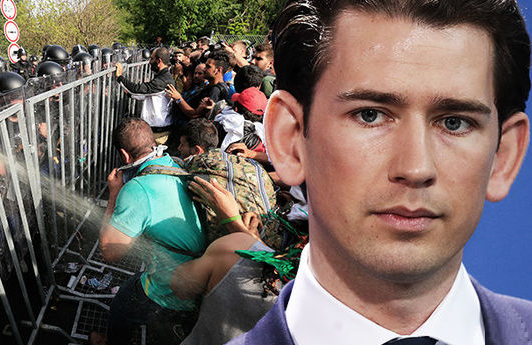 Mr. Kurz has vowed to focus on migration during Austria’s governing period of the EU Council. end deliberate destablization! close ALL borders! deport them all back to where they came!